Next PostNext Jon and Kate: Can Their Marriage Be Saved? As we get ready for next week’s big release, Will Ferrell’s “Land of the Lost,” let’s take a moment to remember the deliciously cheesy Saturday morning television show that inspired it. I get a kick out of silly parodies like this “Terminator” power ballad. 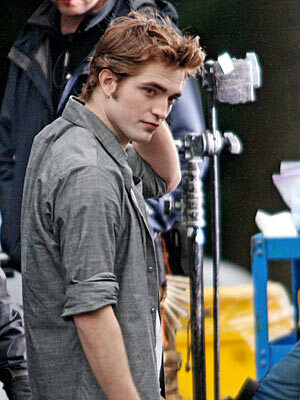 Check out Entertainment Weekly’s gallery of shots from the set of “New Moon.” They say that even though Edward does not play much of a role in the book, fans have been assured that the popular Robert Pattinson will play a significant role in the film. But this film is where we — and Bella — really get to know Jacob, played by Taylor Lautner, who put on 25 pounds of muscle for the role. I interviewed Taylor four years ago when he appeared in The Adventures of SharkBoy and LavaGirl in 3-D , written and directed by Robert Rodriguez (the “Spy Kids” series). At that time Lautner had already won three junior world karate championships. You can see in the interview the qualities that made it possible for him to persuade the producers that he could convince an audience that he had grown up as quickly as Jacob does in the book. Movie critic Shawn Levy, author of the superb books King of Comedy: The Life and Art of Jerry Lewis and Rat Pack Confidential: Frank, Dean, Sammy, Peter, Joey and the Last Great Show Biz Party , has a new book about one of the most accomplished and adored movie stars of all time, Paul Newman. He very kindly made time for an interview in the midst of his book tour. Q: Newman was one of those rare performers who become icons of their eras. What was it about his style of acting and choices of scripts that seemed so particularly characteristic of the post-WWII years? A: He often played younger than he really was, like many actors, but it was particularly his casting as the failed sons of strong fathers in such films as “The Rack,” “Cat on a Hot Tin Roof,” “Hud” and, in a sense, “The Long Hot Summer” and “The Hustler” that cemented him as an icon. He carried the sensitivity of James Dean into a new era when the promise of a film like “Rebel Without a Cause” bled into mainstream and prestige films. He easily segued into rebel/countercultural figures starting in the mid-’60s (“Harper,” “Hombre,” “Cool Hand Luke,” “Butch Cassidy”). And because he was older than the characters he was playing (he was 38 when he made “Hud”), he also carried a savor of mature authority. He played, in short, equally well to both the establishment and the kids who threw mudballs at it. Q: Is there a performance of Newman’s that you think is particularly overlooked or underrated? A: His turn as the stage manager in the Broadway production of “Our Town ,” which is available on DVD, is a classic bit of Americana. In movies, “Hombre ” is tough and sullen and cool in a way you’d associate more with, oh, Steve McQueen than Newman. Both excellent films. Q: What did he consider his biggest failing? A: In acting, he felt he was too mechanical and calculating for the first 25 years or so of his career, and I think I’d agree. You see him pulling poses and striking moods quite deliberately even in such fine films as “The Hustler ” and “Hud .” But later in life he ratcheted back and produced some astonishing performances. In life, I think he felt he was a very remote and arbitrary father until he reevaluated himself after the death of his son, Scott, in 1978.